A PROUD HISTORY, AND MAKING MORE EVERY DAY. Huckins Yacht Corporation incorporates and begins building custom yachts at its Jacksonville yard on East 4th Street. Frank Pembroke Huckins invents one of the first true planing hull forms — the Huckins Quadraconic® hull. Hull #1, Huckins' first custom yacht, is sold to David M. Goodrich of the B.F. Goodrich Rubber Company for $15,000. Frank Huckins designs a balanced outboard rudder used on WWII PT boats and all postwar boats through the 1970s. Huckins competes in the "Plywood Derby," a 195-mile offshore trial for PT boat designs. Huckins competes in the "Plywood Derby," a 195-mile offshore trial for PT boat designs, and is commissioned by the U.S. Navy to build two PT squadrons during WWII. The revolutionary Huckins hull design is adopted for use on all PT boats &emdash; even those produced by other manufacturers &emdash; in the war. Huckins Yacht Corporation moves to a new yard, its current location on the Ortega River. The Huckins construction process shifts from triple-planked to double-diagonally planked Philippine mahogany hulls. Huckins begins sheathing mahogany hulls with fiberglass, later applying resin to the interiors and creating what are now known as "cold-molded" hulls. Huckins Yacht Corporation builds the largest sportfishing yacht in the U.S. at the time  an 80-footer. Huckins unveils the largest motor yacht in the U.S. with a fiberglass-cored hull (cored with the closed-cell PVC extrusion AIREX®). 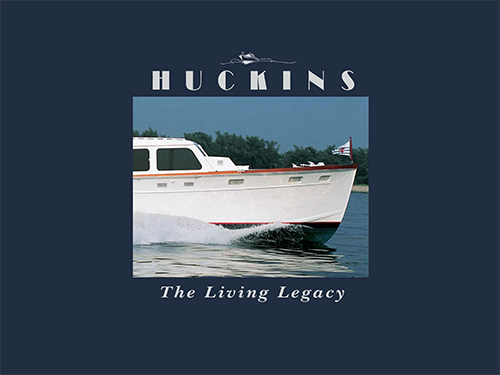 Huckins builds the largest outboard cruising yacht of its time, a 50' Sport Yacht powered with four outboard engines and capable of 38 mph. Huckins builds the largest yacht in the U.S. powered with Arneson surface-piercing propellers. Huckins builds the largest yacht in the U.S. powered with Arneson surface-piercing propellers. This 78' vessel featured wide doors and handicap-accessible features, including an elevator from flying bridge to engine room. Huckins reintroduces the elegance of 1950s and 60s yachting. Huckins reintroduces the elegance of 1950s and 60s yachting. The classic Huckins Sportsman 44, Atlantic 44 and Ortega 44, updated with modern materials, combine yesteryear's panache with today's lightweight fuel efficiency and performance. Huckins Yacht Corporation celebrates its 85th anniversary. The company remains one of the oldest family-owned custom yacht builders in the United States. Delivery of WOMBAT a 45' Sportfisherman. Huckins introduces the new, vintage-style Sportsman 36 and goes green with hybrid power connected to fuel-efficient pod drives. Learn about the history of Frank Pembroke Huckins and how he invented one of the first true planing hulls — the Huckins Quadraconic hull. Also hear seventy years of testimonials from the participants.